Statesville, North Carolina – has a large concentration of Southern style mansions for such a small town. 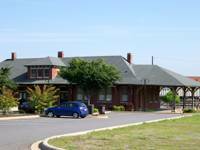 It also has a rich history dating back to the American Revolutionary War including the infamous hanging of “Tom Dooley” at the local train depot (see the picture on left). Statesville is a medium sized community located on Route 70, north of Mooresville and Troutman at the north end of Lake Norman. Exit #48 (route #70) on Interstate 77 north is 38 miles from “Up Town” Charlotte and then 3 miles west to downtown Statesville. Interstate 77 and I40 cross in Statesville at exit #51 (I77) making it a strategic crossroad. Click on links below for listings and interactive maps.